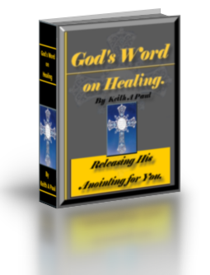 This E Book will build faith and confidence in those who struggle with sickness, disease and infirmity in their body, soul and spirit. It will also empower those who are ministering to others. Jesus Christ has provided our healing and it comes when we believe Him for the impossible. May you be encouraged as you read. May your life be filled with His Presence, His joy and health. I have seen many people touched by God and their health restored by His Healing power. I am not the Healer but only a messenger of the Lord Who called me into ministry many years ago. I have been in public meetings where people who were totally blind in both eyes were instantly healed, deaf people received their hearing, crippled people walked again and many other diseases healed. This is the power of Jesus Christ at work through His Holy Spirit. I interviewed a pastor in South Africa who was stabbed and beaten to death, taken to the hospital, declared dead there and was resurrected the next morning because the church prayed all night and chose to forgive the drunken young men who killed their pastor. All things are possible with Jesus Christ. May your faith increase and your needs be met by the Great Physician Jesus Christ who paid for your healing.